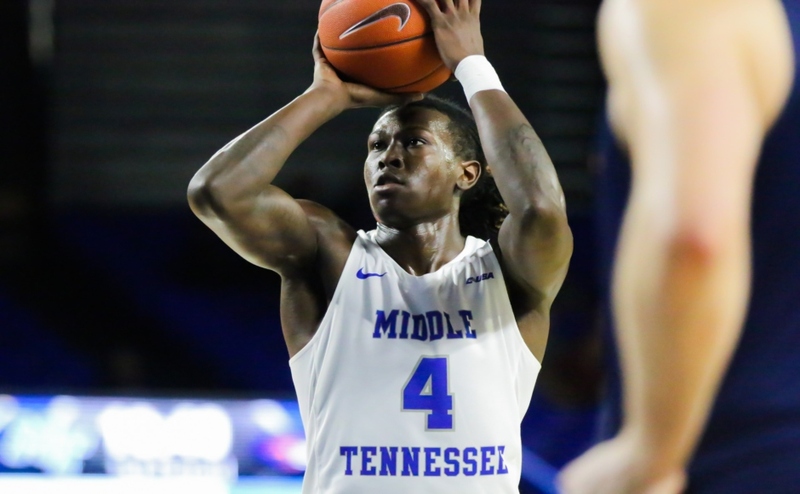 JaCorey Williams dominated the second half with 17 of his 21 points and the Middle Tennessee Blue Raiders (22-4, 12-1) defeated the Charlotte 49ers(11-13, 5-8) to the tune of 70-55. 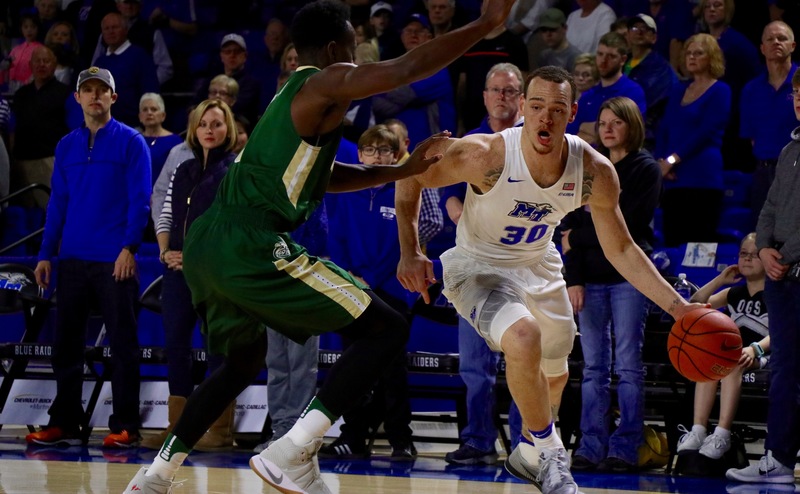 With MTSU stretching the lead to as much as 17, the game did not begin in the Blue Raiders favor. Finding themselves down 12-4, they outscored the 49ers 29-12 over the final 15:08 of the first half to take control of the game. 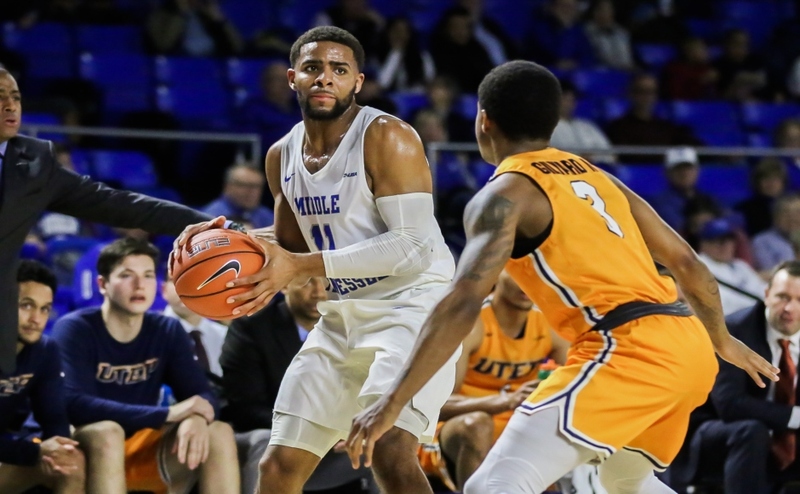 The second half started with the teams trading blows until Middle Tennessee used a 9-1 scoring run, punctuated by a fast break slam from 6-foot freshman Tyrik Dixon and a JaCorey Williams jumper, to push their lead to 56-39. 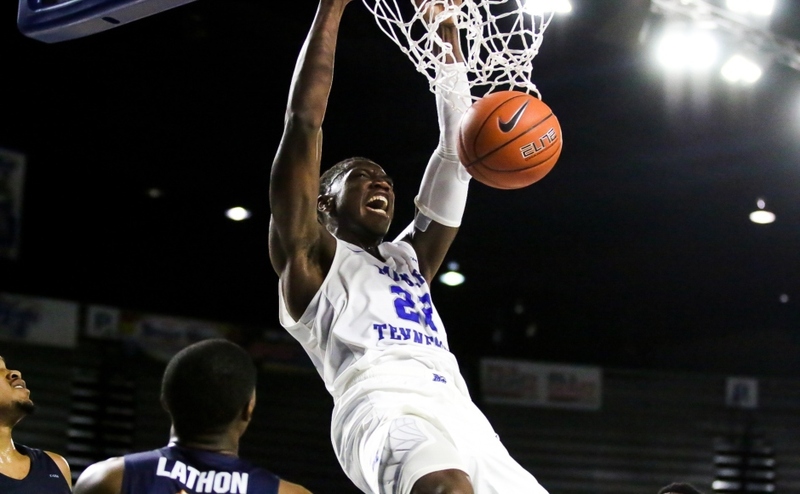 Williams gave MT its biggest lead of the night with an emphatic And-1 slam to close it out and MTSU won 70-55. The paint was key early on, as the 49ers took an 18-10 interior advantage into halftime. 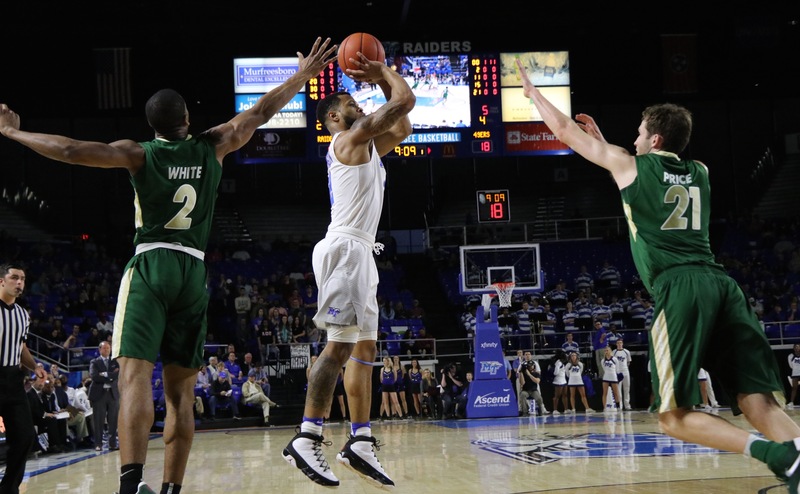 The Blue Raiders fought back in the second half and with Williams’ play, they ended with a 34-30 edge in the paint, which coach Kermit Davis said was due to their second half toughness. The 49ers started the game with all the energy, using five early points from Najee Garvin to take a 12-4 lead at the 15:06 mark. 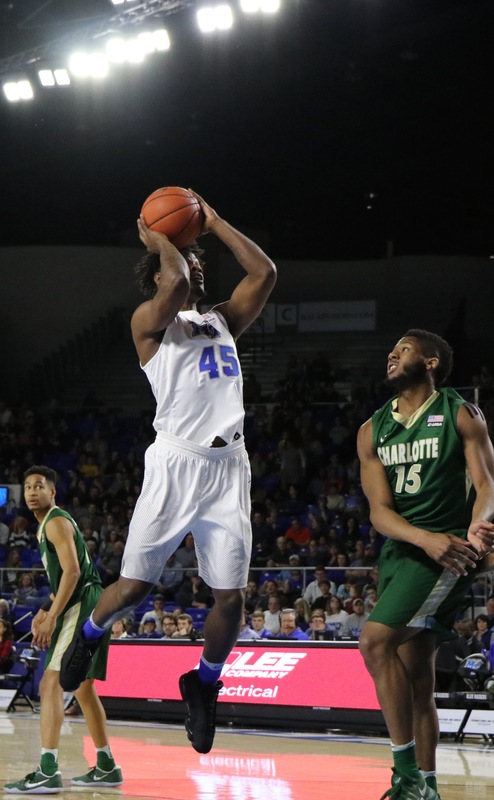 They held the Blue Raiders in check on defense too, as Middle made only two of their first seven shots and by the midway point of the half, Charlotte held an 18-11 lead. 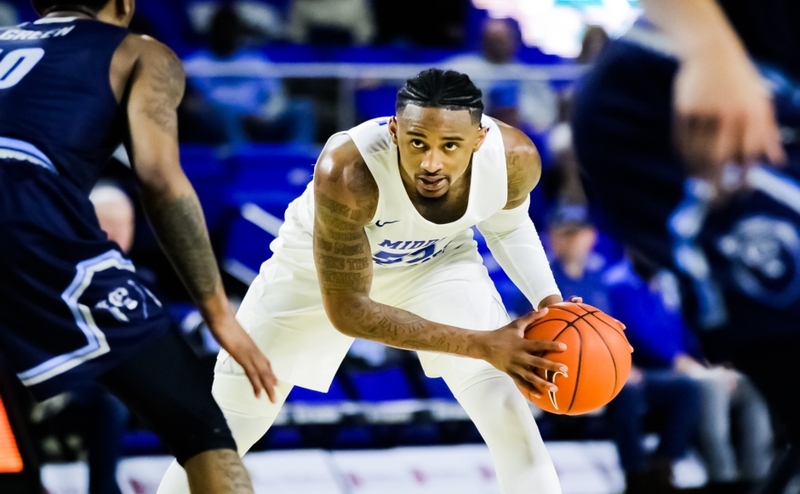 Reggie Upshaw took matters into his own hands, as he keyed a crucial 9-0 Blue Raider run to take a 20-18 lead with 6:37 left in the first half. MT closed the first half on a 13-6 run to take a 33-24 lead into the locker room. Going into halftime, Williams, the team’s leading scorer, only tallied four points. The senior forward stopped settling for jumpers in the second half and began playing more physical in the paint, leading to easy baskets and opportunities at the free throw line. His team challenged him at halftime, saying that he needed to take on a more aggressive role in the paint. While he only registered four points and five rebounds, senior forward Aldonis Foote did much more than score as his energy helped the Raiders turn the game in their favor. Williams knows that most of what Foote does isn’t displayed in the box score, but he was glad everyone got to see what he sees from his teammate on his daily basis. Coach Davis also thought that Foote was key for the defense, as he led the team’s vaunted 1-3-1 zone. “We were struggling in our 1-3-1 and I thought his presence at the top of the zone was good,” Davis said. JaCorey Williams owned the second half and finished his night in style. 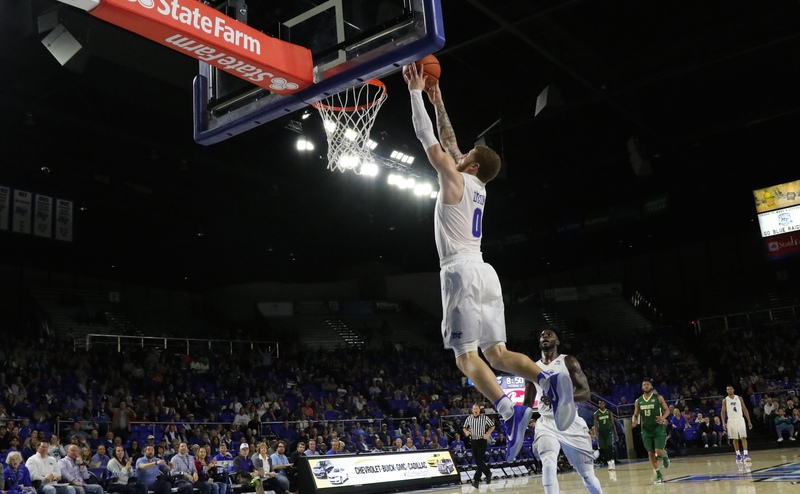 Here, he takes the bounce pass from Tyrik Dixon, gets fouled and finishes the play with a Blake Griffin-esque slam to send the crowd home happy. 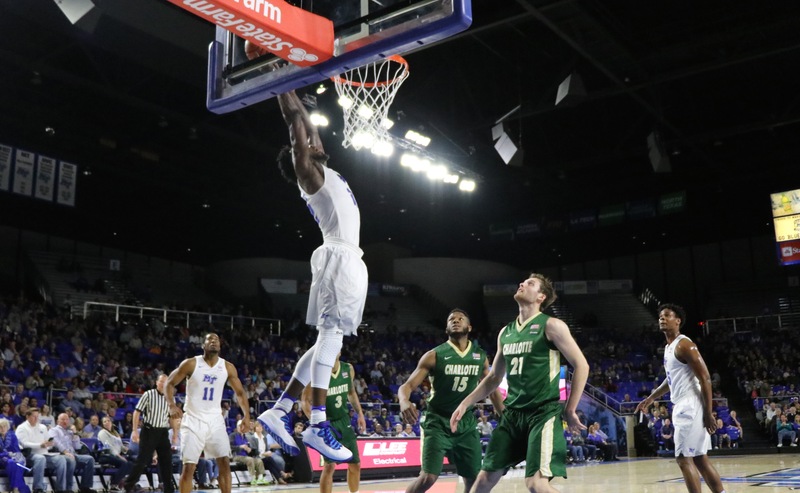 The Blue Raiders will return to the practice court on Monday before heading to Bowling Green, Kentucky for a showdown with rival Western Kentucky on Thursday with tip-off set for 8 p.m. The game can also be viewed on the CBS Sports Network.